The Bay Area rapper and spoken word artist rises up for all Filipinos, Asian Americans, women and all marginalized people worldwide. 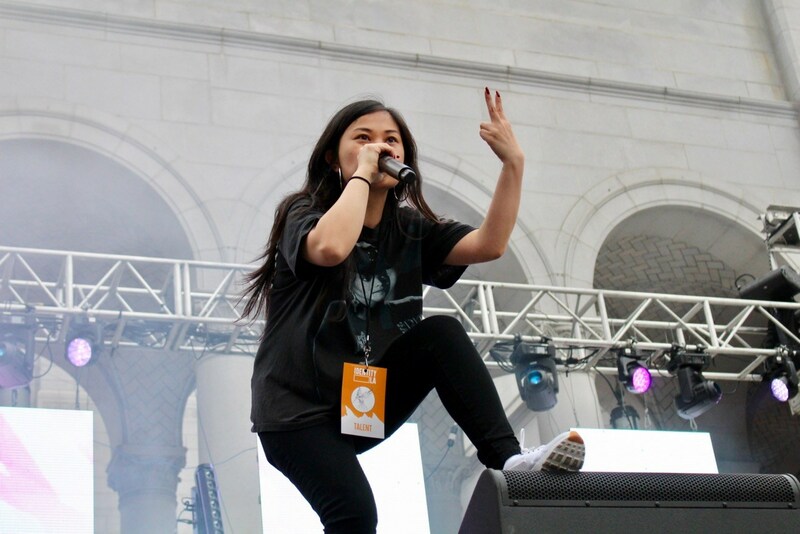 2018 has been a big year for Bay Area-based rapper, poet and spoken word activist Ruby Ibarra, whose small stature and hard-hitting lyrics that show her speaking in three different dialects — English, Tagalog and Waray (native to her hometown of Tacloban, Philippines) — prove she’s only just beginning. New fans, listeners and fellow Filipino/Filipino Americans all reigned in support of Ibarra at Identity LA as she brought onstage Klassy to sing “Us” to a crowd that went wild, in awe of the different dialects Ibarra interchanged throughout her set. Ibarra, who often writes about womanhood, her cultural identity and the immigrant experience, isn’t afraid to speak about the Filipino experience as she knows it. The Tagalog phrases in “Us,” which translate to speaking directly to her fellow Filipinas that “nothing can stop it” and “to know where you’re from,” are just a taste of what her debut Circa91 album, released last fall, talk about. In songs like “Taking Names,” which Ibarra closed her set with, she talks about the system mispronouncing names, her people bleaching their skin white and being in the jungles of the Philippines to Filipino American kids at their college PCNs (Pilipino Culture Night). As the crowd lifted up their hands in solidarity — mimicking Ibarra’s video for “Us” — it was clear that Ibarra was speaking a message for all. She provides a voice for all Filipinos, Filipinas, people of color and marginalized people worldwide, and the reigning support and crowds of up to 10,000 at Identity LA proved that her words have an effect — and the people are listening. Ibarra, who also had appearances the following week at CAAM Fest in San Francisco as part of Directions Of Sound, as well as a performance at the Long Beach Filipino Festival on May 19th, has had a fruitful month. Her documentary, Nothing On Us: Pinays Rising, an intimate look behind the process of producing her iconic “Us” music video, had its world premiere during CAAM Fest at the Roxie Theater in San Francisco that same weekend, where she noted she will be releasing her next music video from Circa91 soon. Follow Ruby Ibarra on Facebook, Instagram, YouTube and rubyibarra.com. For the complete Identity LA 2018 coverage, click here. This article was featured on Blurred Culture. ← “Matangi/Maya/M.I.A.” Documentary Gives Intimate Look Behind British-Sri Lankan Pop Star M.I.A.